There is something about a classic floral design that just reminds you of spring and happy memories. While contemporary designs are more common now days, the classic floral design will never go out of style as they are more modern than some people will ever come to realize. The classic floral design can be used in numerous different vases and containers which will make the old school look seem like a great fit no matter what your interior décor is and will also bring out many colours within your home that you never truly noticed before. Here are a few simple yet extravagant classic floral designs that you can do yourself and use as centrepieces or just coffee table décor. If you go to any lawn and garden shop, you can find the classic metal watering can and a can of spray paint to create not only a simple yet elegant vase. You can then pick a colour in the room that you want to place your floral design and choose a variety of flowers that fall into that colour scheme. Pinks, for example, can be found in various shades and vibrancies that will spark up any room in your home with a touch of colour. 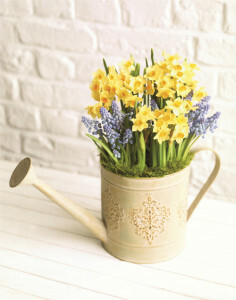 Arrange these flowers in the metal watering can however you like and you have yourself a classic floral design that will pop and attract many conversations within your home. Many people go antiquing and find fun shallow containers that just sit around the home without a thought as to what to do with them. Many of these containers may be metal but others will be glass or of another classic material. 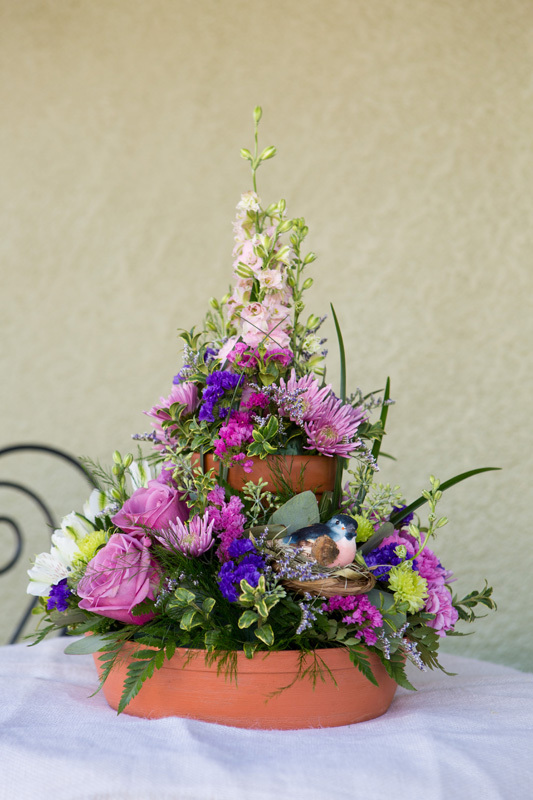 While you may think that these containers are too shallow to hold your floral arrangement, think again. If you pick up a floral foam ball and cut it in half, you can easily place a small amount of water into the container and place your flowers into the ball. The ball will wick the right amount of water to your flowers and hold them in place with little effort. You will want to use a colour scheme for your floral arrangement that matches both the room you plan to put it in and the colour of the container. Generally lighter colour flowers make an excellent fit. 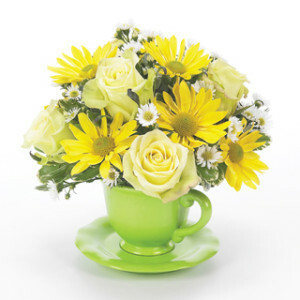 While hunting for the perfect vase for your floral design, don’t neglect or leave out the humble tea cup and saucer. These make perfect vases for smaller flowers and you can even place a couple of larger flowers around the rim of your cup. 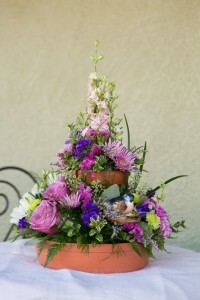 This kind of design is perfect for wild flowers, mums, baby’s breath, and various other small flowers. While people wouldn’t think that this would make much of a floral design option, you can actually do a lot with a cup and saucer. If you pick up wax fruits from your local florist or even online, you can create a beautiful summer arrangement based off the colour of the strawberry and the colour of your tea cup and saucer. This classic floral design allows you to use flowers of various stem lengths to create a classic and timeless floral design. Using a standard vase, place the shorter stemmed flowers around the bottom of the arrangement and longer stemmed towards the top. While you can still use any vase you wish, one with a narrower opening it best suited for this design as it provides a more hourglass shape and is less likely to fall over with the wider base. However with the right creative edge, you can easily use anything you wish to hold these flowers into the design that you wish. Blue and Violet flowers mingle beautifully with clashing colours and are the perfect harmonizers in any room or décor scenario. These can be placed in any container that you wish as they contain several pairing colour patterns that it is hard to go wrong. In your floral design, you will want to use lilacs, hyacinths, violets, tulips, and any other purple and blue flower that you wish. While you can always arrange these flowers how you wish, placing the brightest and most vibrant flowers in the centre of your vase will create a focal point and is something that you may want to consider when completing this unique floral design. Everyone is familiar with the round bouquets that look like balls sitting in a vase, but what about the far reaching arrangement. This type of classic arrangement has a flare for the dramatic and will start instant conversations. Your friends may even as you to make one for them. Using a variety of stem lengths, start the base of your arrangement by placing the shorter stems towards the bottom of the arrangement and progressively longer as you get to the middle. Then use the longest stemmed flowers that you can find such as snap dragons or other long stemmed tiered flower and pace them around the base and pointing in all directions. When you are finished, your arrangement should look a bit like a star burst. Peonies are perfect for this classic arrangement since they line up nicely next to many other flowers. You can pick up a small vase and set it inside of a small basket and arrange roses and peonies in stripes into the arrangement. This brings out beautiful contrasts and blends between matching flower colours that you just don’t get with many other flower arrangements. This is perfect for any room in the home as well since it will bring out many colours in the room with ease. There are many other flower arrangements that you can do that are of the classic style to bring a sense of elegance to your home. And while these arrangements are easy to do, they look much more complex than they really are.